I love new peas and potatoes. I would eat it a couple times a week if I could get it. Unfortunately, there is a limited window for this dish because the garden only gives out new peas and new potatoes in a very short window once a year. In the past, when I’ve experienced a craving for this dish in an off season, I’ve just grabbed a bag of frozen peas and some large potatoes and made do. It lacks freshness though and leaves me feeling somehow disappointed. With this craving in mind, I decided to rethink the peas and potatoes part of the recipe. What could I do to make this dish move with the seasons? I’ve recently discovered that purslane (Portulaca oleracea) is a great new twist on this classic dish. Purslane is a weed to most folks. It’s best picked in June and July. These are months that you wouldn’t normally be harvesting fresh peas, so it already fits my requirement for a fresh fill-in. This plant is often found in the garden and routinely pulled out as a nuisance. It is related to moss rose which is available at most garden stores. It is a succulent plant, one that tends to have glossy leaves and stems that look as though they are inflated with air like a tire. There is evidence of using purslane as a food crop or medicine all the way back to at least the pre-Columbian era in North America. It has been, and continues to be used all over the world, though in present day America it is vastly overlooked. 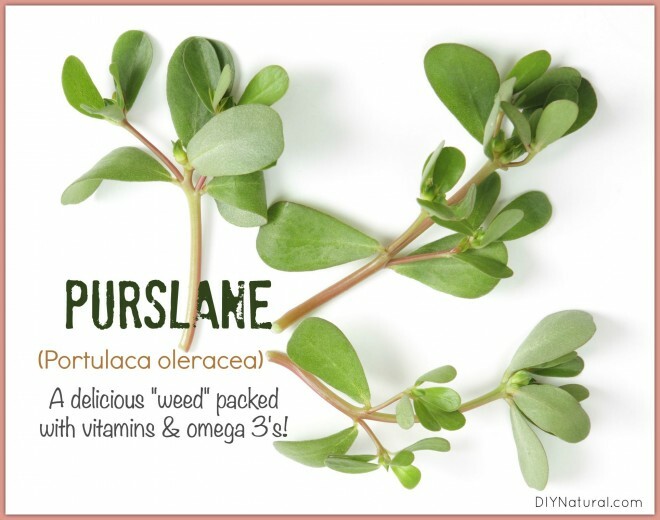 Purslane is high in vitamins A, B, and C. Its most remarkable attribute is the surprising amount of omega-3 fatty acids you can obtain by eating it. Many people take expensive fish oil supplements to cover this important part of our diet and here it is growing in our yard for free! Just from the vitamins and omega-3’s alone, this plant is very good as a boost to the endocrine system as a whole. Specifically, it would be very helpful for those suffering with adrenal exhaustion or thyroid imbalances. It has folkloric use in sore mouths and to ease a toothache. The seeds, leaves, and juice of the plant have a long history of use though there is a bit of controversy around it. There is both love and hate for purslane in historical documents – where you’ll see both recommendations to use it freely and suggestions to stay away from it. When there is a split in the historical data like this there is often a reason. In this case, purslane has a high amount of oxalic acid. A little bit of the plant raw is fine, but it is best to steam or cook purslane to avoid digestive disturbances. Bring a pot of water to a boil. Add potatoes and boil for 15-20 minutes or until tender. Drain. Cover the purslane with water in a separate pan and boil for 5-7 minutes or until tender. Drain. In your saucepan, melt butter over medium heat. Stir in the flour to make a roux (thick paste); slowly whisk in the milk and stir constantly until thick. Add salt and pepper to taste. Add in the potatoes and purslane and coat with your sauce. Serve immediately. Thanks for the info. New peas & potatoes in a milk sauce has been a “family favorite” through the generations. I have been weeding out this plant for years. No more! What parts if the plant to harvest? Just leaves or also stems? Leaves and stems… pretty much everything above ground. I’ve even eaten it after its developed seeds. It’s a bit gritty then, but still delicious! Purslane grew prolifically at my previous residence. This was before I knew I could eat it ! At my new home, only blocks away, I have not run across it. Do you know if garden centres carry it ? I live in Orangeville Ontario. Is this the same as “pig weed”.? We eat that weed from the field. I saw this in my garden and thought that it was pretty, but I pulled it and through it anyway because to me it was just a weed. Now, I know I have some “free” goodies in there and if I leave them alone somewhere, they’ll even be pretty! I wonder if I can transplant them. *threw it away…man it’s early.